Joel performed his 40th residency show on Good Friday, his 86th career performance at The World’s Most Famous Arena. 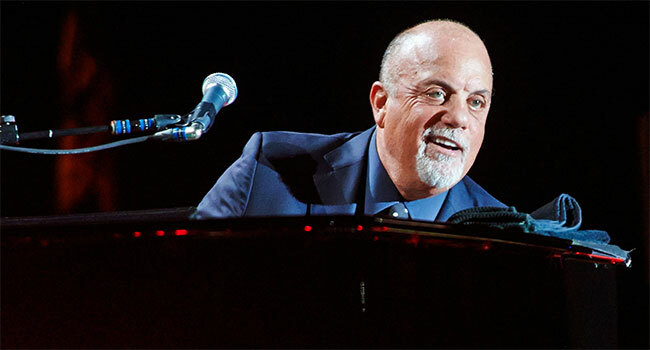 The depth of Billy Joel’s catalogue was on display during his 40th consecutive residency show at Madison Square Garden last night (Friday, April 14th). Throughout the evening, Joel gave the 18,000-strong crowd a history lesson, naming the title and year of the albums the numbers were from before launching into them with the full force of his backing band. Many of those songs were released well before half the audience was born. Opening with “Miami 2017 (Seen the Lights Go Out on Broadway)”, Joel did not let up. Cramming 27 songs into two hours and twenty minutes, he played a little of everything from his catalogue. It is a true testament to Joel’s career that he can stop the show to let the audience choose, and both songs on offer receive a rousing ovation. At this concert, the crowd chose “For the Longest Time” over “An Innocent Man”. It sounded just as good live in 2017 as it did on the 1983 recording. Billy Joel has enjoyed a staying power few in the music industry will ever experience. He has not released any new pop material since 1993’s River of Dreams. Still, his lyrics and melody from 30 and 40 years ago continue to permeate the popular culture. This was easily seen at the Garden, where people of all age sang along, cheered, and danced, helping Joel turn the arena into a piano bar. The thing about Joel’s catalogue that is once amazing and infuriating is that the audiences never knows what they are in for during a live show. Die-hard Joel fans want to hear everything, and the singer knows how to find the right balance between those popular album cuts and singles. But that means he also has the tough job of figuring out what songs to cut. Staples like “Ballad of Billy the Kid” rarely make an appearance these days. Taking the piano shortly after 8:30, Joel was dressed in an all-black suit, seemingly allowing him to disappear into his large songbook. The show’s special effects, too, put all the emphasis on music. Minimal lighting and video displays added to the complex lyricism and instrumentation. The piano itself turned on a turntable. This allowed all parts of the arena to see Joel’s mastery of those 88 keys. After the first few songs, he joked about the Lazy Susan, remarking, “Elton’s doesn’t do that”. Seven long, rectangular screens hung above the stage, appropriately reminiscent of the keys on a keyboard. This allowed the far reaches of the arena to get a glimpse of the Joel’s performance energy, which varied between stoic and manic. The show was played on an in the round stage to allow even more people to enjoy the music. Fans could be seen dancing high behind Billy Joel’s backing band. There was no barrier between the Piano Man and his audience: no matter where anyone sat, they were right there with him. Bill Joel is known for inviting surprise special special guests, and his 40th consecutive residency show was no exception. House of Cards star Kevin Spacey joined in on “New York State of Mind.” Spacey’s from Jersey, but we forgave him. And, damn, can President Underwood sing. Bill Joel continues to sell out shows as a fixture at Madison Square Garden. Concerts have been announced through August. That particular show will mark his 44th during this run, and 90th career performance at MSG. If (and when) he performs this residency through the end of 2017, Joel will have performed more shows at the Garden in the last four years than in the entirety of his career previously. The historic shows began as an incredible idea and took off beyond anyone’s expectations. Sometimes a Fantasy is the Real Thing.